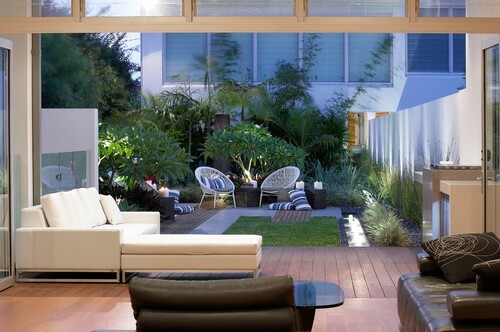 When it comes to backyard design, it doesn’t always have to be just one option or the other. We love the look of mixing, matching and blending styles, tones and textures to create diverse and versatile outdoor living spaces. One of our favorite combinations is blending warm-toned decking with the deep greens of artificial grass. This is a great way to create a cosy yet modern space that’s easy to maintain and useable all year round. Artificial turf is the perfect way to complement the other greenery in your backyard, and in the picture below even the smallest square mixed with decking and concrete softens this outdoor living space, and really makes the Asian-inspired garden’s colors pop! 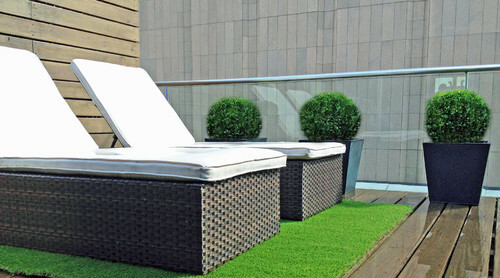 We’ve always loved the look of an artificial grass rug, and this balcony garden is no different! The grass over the decking brings this sky lounge back to earth, adding warmth and a comfy place to rest your feet! We’re in love with this oriental-inspired landscape and the minimalist use of decking to break up the heavy greens and create a tranquil space to zone out with a book (or a glass of wine!). Now these homeowners love decking and know how to use it. 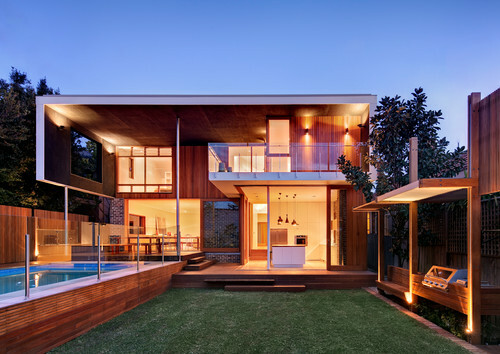 With an entire house covered in timber, their use of artificial grass perfectly contrasts with the modern tone of the house, while also making a vast and versatile play area and chill space! If you’ve got a small outdoor space like the home above, mixing textures is the perfect way to open it up and make it look larger. 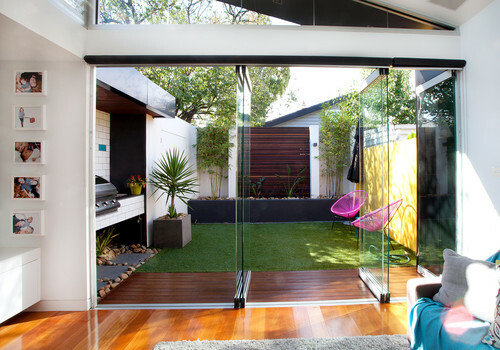 The decking creates an inviting entrance into the garden, while the grass makes room for the kids to play soccer, or just to sprawl out and relax in this miniature oasis. We love the contrast in this Manchester Deck-designed sky garden. 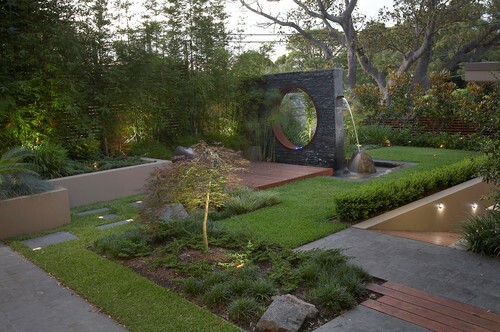 Not only does the green grass break up an otherwise entirely brown space, but it adds shape and size to the space with its eye-catching curved design!